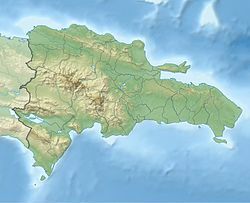 Baitoa is a municipality in the Santiago Province of the Dominican Republic. It was recently created as a municipality on June 1, 2014. Baitoa is located within the northern valley of the Dominican Republic, also known as the Cibao or El Cibao. Natives of Baitoa are known as Baitoeros. The first school of Baitoa, Liceo Prof. Gabriel Franco, was founded and named after Gabriel Franco. It is located near Carretera Santiago Baitoa, the main highway traversing the region. Franco was one of the first educators in the region at the turn of the 20th century. He was the son of Catalonian immigrants, Justo Franco and Maria Francisca Nunez. Liceo Prof. Gabriel Franco is still open today. The main hospital of Baitoa is Hospital Municipal Antonio Fernandez, incorporated on September 28, 2012. On June 28, 2017, the Mayor of Baitoa, Bernardo Lopez, organized a protest in front of the national palace, demanding a clean water supply system for his constituents. The local population of Baitoa are predominantly of Roman Catholic origin. One of the local churches is Iglesia San Ramon, or Saint Ramon Catholic Church. This page was last edited on 13 December 2018, at 13:14 (UTC).